It’s not often you hear stories that inspire others to cope with their own suffering. Or, that the dying can teach us about living. But the story of Jūratė Jurgutyte-Foran, who passed away at Toronto General Hospital on May 2, 2015, does just that. Jūratė was a wife, mother, sister, and friend. Jūratė was humble, non-judgmental and an amazing conversationalist. She could talk to anyone on any level about any subject and make that person feel as though they were the most important person in the room. Her quiet and unassuming manner made people remember Jūratė just as she was. A very loving and likeable person. Jūratė possessed an inner strength that was rare. In 2004, Jūratė was diagnosed with cardiac amyloidosis, a rare disease that necessitated a life-saving heart transplant. To treat the amyloidosis, her heart transplant was followed a year later with a high-risk stem cell transplant a year later. Every step of her journey was taken with acceptance, courage and grace. Born in Hamilton Ontario in 1953, Jūratė’s parents immigrated to Canada in 1947. Many relatives who continue to live in Lithuania have visited us over the years. Our daughters visited Lithuania in the summer of 2013. While holding a full-time job, Jūratė’s father Jurgis built houses in the evenings. Jūratė learned to adapt to change, moving over 20 times before settling on the home of their dreams in 1967. We met in first year while attending McMaster University. With just one look I was smitten by her gentleness, humility and easy going nature. With our group of old high school friends, every Friday night after class, we’d share a pitcher of beer and a pizza before heading to the basketball game. After graduating, Jūratė went on to have a successful banking career as Treasury Operations Manager for a U.S. bank. We married and went on to have two daughters. When our first daughter was born in 1984, we chose the road less travelled, and in spite of the sacrifices we knew we would have to make, Jūratė gave up her career and stayed home to raise her children. Our daughters, Jessica and Stefanie, have grown into two women a lot like their mother. In June 2004, while on a short family vacation and business trip to Ottawa, Jūratė was having trouble keeping up. Short of breath, Jūratė would have to sit down after walking any distance over 30 metres. Back at the hotel we were taken back by her swollen legs. Little did we know she was retaining excessive amounts of fluid. On return home, while attending a stress test at St. Joseph’s Hospital, Dr. David Higgins, now President of St. Joseph’s Health Sciences in Hamilton, and Internist, Dr. Mirek Otremba, now at Mt. Sinai in Toronto, took one look at Jūratė’s carotid artery and found her to be in heart failure. Over the summer Jūratė’s condition worsened and was transferred to Toronto General Hospital in October. 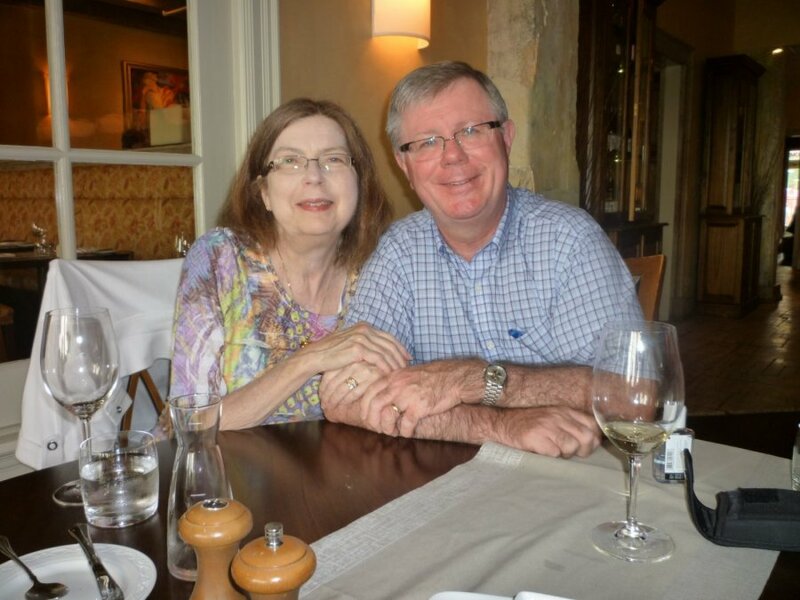 Three days later, she was diagnosed with cardiac amyloidosis and placed on the list for a heart transplant. Amyloidosis is a blood protein disorder. If the proteins build up in your bloodstream they settle in vital organs causing organ failure. If it settles in your heart it causes the right ventricle wall to thicken making it increasingly difficult for the heart to pump blood sufficiently well to vital organs. Affecting only eight in one million people, amyloidosis is rare and not widely known in the medical profession. It is significantly under-diagnosed. When it settles in your heart, from onset of symptoms, untreated, death can come in six to eight months. Many pass away not knowing they had the disease, and, if it is diagnosed, depending on the affected organ, people die because it’s too late to do treat. Had amyloidosis also settled in Jūratė’s kidneys or liver, Jūratė would not have been a candidate for a heart transplant. She received her new heart on November 14, 2004. While attending a fund raising event to support her cardiologist Dr. Heather Ross’ “Test Your Limits” trek to the South Pole, we ran into her transplant surgeon, Dr. R. J. Cusimano. He came up to Jūratė and told her that while he had performed many heart transplants, her transplant stood out the most. We knew her transplant was difficult but what he told us was astounding. He told Jūratė that her heart stopped before the new heart had arrived. She was kept alive by doctors massaging her heart until it did. Had the new heart been unsuitable for transplant, Jūratė would have died that night. While opening her chest and before they could get her on the heart-lung machine, it stopped again. Amazingly, they brought her back and finally got the surgery underway. It was a success. But there were setbacks. Only a few days after her transplant, as a result of a serious infection and with Jūratė’s kidneys struggling, Jūratė was given a 50/50 chance of making it through the night. For reasons I cannot explain I left the hospital to be home with our daughters. I didn’t have the strength to tell them Jūratė might die that night. For some reason I just knew that because of our strong faith Jūratė would pull through…and she did. Before I left Jūratė that night, I prayed for her. I could feel an overwhelming presence in her room. I just knew she was being watched over and she would be OK. Six months later, just after Easter, Jūratė returned home. In the comfort of the last home her father had built, her recovery soared. However, to treat her amyloidosis, the underlying condition that attacked her heart, Jūratė still needed a high risk stem cell transplant. Under the care of one of the best hematologists in the world, Dr. Donna Reece, the stem cell transplant was performed in 2005 at Toronto’s world renowned Princess Margaret Hospital. Melphalan, the high-dose chemo drug given to destroy all of Jūratė’s bone marrow, would be enough to kill anyone without the disease. Jūratė pulled through again and was discharged after a one-month hospital stay. The stem cell transplant successfully sent the amyloidosis into remission. While amyloidosis is not cancer, it behaves in a similar manner and, like cancer, it can go into and out of remission. In June 2008, three years after the stem cell transplant, Jūratė’s amyloidosis did come out of remission. Without further treatment, it had the potential to weaken her heart again. Fortunately, under the care of Dr. Reece, Jūratė was accepted into a clinical drug trial for Velcade, a powerful new chemo drug. Jūratė travelled to Toronto to receive Velcade twice weekly for two weeks, with one week off and then repeated. To ensure the proteins Velcade was designed to keep under control would prevent further organ damage it required close monitoring. It was a delicate balancing act between alpha and beta proteins. In October 2014, another setback. Jūratė was diagnosed with rapid onset cardiac allograft vasculopathy (CAV). For reasons unknown, CAV is a unique form of hardening of the arteries that affects heart transplant patients differently than arteriosclerosis in patients without heart transplants. Unless caught early, successful stenting is very difficult. Jūratė needed five stents. Over two separate procedures they were only able to do one. After the procedures, Dr. Ross was frank and honest. She told Jūratė she was palliative and might have a year to live. Over the years we became accustomed to hearing news like this. We didn’t quite know how to react and I don’t think it really sunk in. Hope is a big part of the healing journey. We felt that admitting you were palliative was like giving up on the potential for another miraculous recovery. We didn’t quite know how, or if, we should communicate it to family and friends. We were very guarded in what we said. In March 2015, a few months later, another setback. After seven years and almost 500 chemotherapy treatments, Jūratė was told that the Velcade that kept the amyloidosis in remission since 2008 was no longer working. Dr. Reece explained that she was eligible for another new and even more powerful chemo treatment, Revlimid. In spite of the risks we were warned about, we felt it was our only hope and chose to start it. Considering Jūratė was already in a palliative state, looking back, maybe the right choice would have been to stop the chemotherapy altogether. But in the past, Jūratė faced these challenges with courage and hope. We both believed that not taking Revlimid would be like giving up. Jūratė was not a quitter. We believed this treatment, like the others she faced head on and without fear, would give us more time together as a family. While Jūratė was taking Revlimid she was admitted to Toronto General on April 17 with an infection. The first rule is to never take chemo drugs when you have an infection. Jūratė had been taking Revlimid for four weeks. This was not a good sign. Two days later, on April 19, a palliative care doctor told Jūratė that she had three months left. It was a time of immense struggle for Jūratė. She could walk only with great difficulty. Her kidneys were struggling and she was filling with fluid. I think Jūratė knew she was dying but, like everything she confronted in the past, she chose mind over matter. Like a protective mom, she held things inside because she didn’t want her suffering to be a burden on us. On Friday, May 1, I left the hospital at 11:30 p.m. and returned at 6:00 a.m. the next morning. At 6:30 a.m. I tucked her under the covers and we looked into each other’s eyes. Her expression was one of immense sadness. She knew her life was ending. She lifted her head off the pillow wanting to speak, rested her head back down and quietly passed away. I still remember the first time our eyes met back at McMaster. Our lives together ended the same way we began…with just one look. Her suffering over, the love of our lives slipped away. While her daughter, sisters and close friend had final visits with her, they were not able to say final goodbyes. I think it was Jūratė’s way of saying, “till we meet again”. Since Jūratė passed away, our daughter and I have seen signs of her presence in our lives, just in a different form. For me, the strongest was when I opened a Christmas cracker in the presence of family on Christmas Day. We were all stunned when out came a silver chain with two hearts attached, one smaller than the other so that it would fit inside the outline of the larger heart. It is testimony that Jūratė lives on in our hearts and our minds. Over the ten years that Jūratė lived with her new heart we celebrated each day as a gift. At times it was not easy. There were several near death incidents, infections, pneumonias and stresses. During this time we faced additional pressure and time constraints. During this time I looked after my elderly aunt transitioning her to a long term care facility and visiting regularly. Jūratė’s desire to see her daughters graduate, birthdays, and anniversaries provided us with memories that were captured in an annual scrapbook given to her every Christmas. In spite of being poked for blood samples more times than anyone could ever possibly imagine, Jūratė never complained and her personality never changed. She was fearless. I do not know how she coped and never complained. Right to the end she was the same person. Dr. Ross said that at any one point in time Jūratė would rank as one of the top 100 most complicated health cases in the world. She said Jūratė had “an inner strength never quite seen before”. From the beginning of this journey in 2004, we became involved in HeartLinks, a social and support community of 250 heart transplant recipients at Toronto General Hospital. While I published a semi-annual newsletter, Jūratė and a team of others organized semi-annual speaker events, an annual Potluck and helped at the annual Craft Sale. One of the most satisfying programs Jūratė started was the reinvention of the post-transplant recognition program. Rather than waiting ten years to be recognized, a milestone most heart transplant patients do not get to see, Jūratė laid the groundwork so that recipients received recognition at one, five, ten and every five years thereafter post-transplant. Recognizing victory over certain death without a heart transplant, participation in HeartLinks soared as a result. 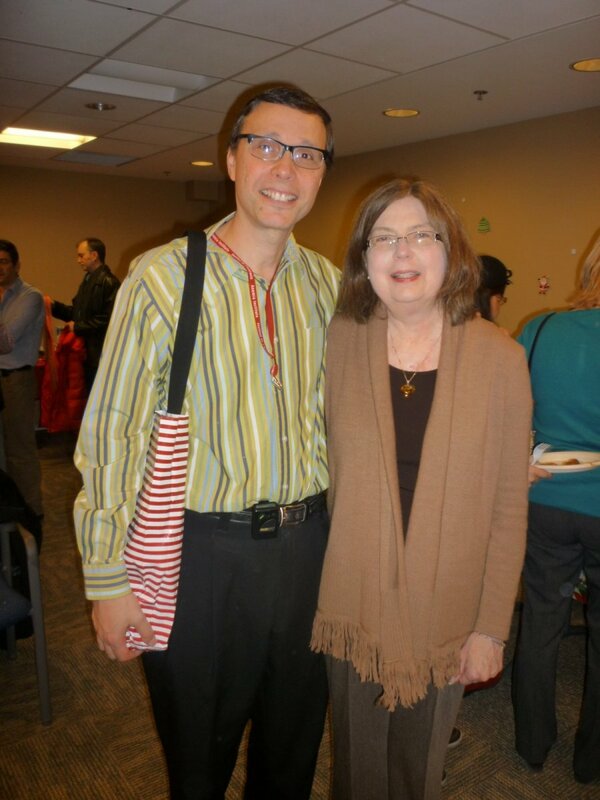 In December 2014, Jūratė received her ten year pin at Toronto General Hospital. Given how complicated her health was, it was a milestone many never expected Jūratė to see. Like a home coming, the annual recognition program is attended by almost 200 heart transplant recipients, caregivers, family, nurses, surgeons, scientists, and cardiologists. Jūratė’s cardiologist Dr. Heather Ross, transplant surgeon Dr. Cusimano, and pre- and post-transplant coordinators, Corinne McCurdy and Stella Kozuszko, all with her right from the start, were in attendance. Over the years of our involvement in HeartLinks, there were two particularly memorable events. The first was the 25th anniversary of HeartLinks. It was held in 2013 at Toronto’s renowned boutique hotel, the Gladstone built in 1889. The evening was emceed by popular CBC Fresh Air radio host Mary Ito. It was a night to remember. Not only was it a celebration of life, but it was a celebration of our caregivers. Dr. Ross, leads an amazing team of people. She is not just a world renowned cardiologist. It doesn’t end there. Dr. Ross is also an amazing singer and sax player. Her band, The Marginal Donors, played to a packed room of over 200 heart transplant recipients, their families and medical staff. She was recently named by Canadian Geographic as one of Canada’s Top 100 Explorers. As part of her “Test Your Limits” program to raise awareness of the benefits of heart transplantation, she has travelled to Antarctica’s Vinson Massif, the North and South Poles, canoed the Nahanni River and attempted the Himalayan Snowman Trek, one of the world’s five most difficult treks. Travelling with her on these each Test Your Limits trek was heart transplant recipient Dale Shippam, a firefighter from Thunder Bay, Ontario. Dr. Ross is a caregiver full of empathy who goes to great ends to care for her patients. A remarkable person, Dr. Ross is Medical Director of the Cardiac Transplant Program at Toronto General. She was the first research chair for the Ted Rogers Research Centre for Heart Failure. As a result of her efforts, the Rogers family donated a jaw-dropping $150 million dollars to create a truly transformative centre to fund pioneering research in heart failure and to fund innovative solutions for care of heart failure patients. It will reduce the need for heart transplants and reduce the number that die on the wait list for a heart transplant. With matching gifts the fund has reached almost $250 million. Families who attended the 25th anniversary event finally understood why and how precious they held Dr Ross, her team, and the transplant program. How thankful they were for their second chance at life and just what an amazing culture of care they had at Toronto General. 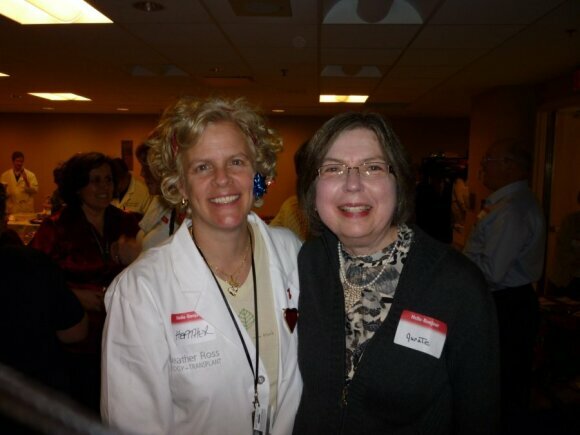 That night, considering Dr. Ross is always telling patients what to do and what not to do, the audience turned the tables on Dr. Ross when, much to her great surprise, they sang a song to her to the tune of Sonny and Cher’s “The Beat Goes On”. The night was electric. The second event that Jūratė started was the Valentine Cookie Appreciation event held, very appropriately, on Valentine’s Day. Among those who survive heart transplants and other life threatening diseases like cancer, finding suitable and cost effective ways to say thank you to caregivers is something you always look for. It’s hard to do adequately when you are in such deep gratitude. In fall 2010, while visiting Elm Hill Cookies, a new bakery in Oakville Ontario, Jūratė came across a gingerbread cookie with a pink heart. The cookie was designed by culinary artist and bakery owner Janis Smith. With this special cookie, Jūratė started the annual Valentine Appreciation event. Every Valentine’s Day since then, as a way to say thank you, heart transplant recipients distribute these special gingerbread cookies with the pink heart to all 450 plus staff involved in all forms of solid organ transplantation at Toronto General and Toronto Western Hospitals. At one event, Ontario’s Minister of Health Deb Matthews, participated where a patient, waiting for a heart transplant, gave the minister a live demonstration of a Left Ventricular Assist Device (LVAD) that bridges people to transplant and was keeping her alive. The popularity of the Valentine program grew immensely, raising awareness for organ donation and the heart transplant program at Toronto General. It also pays tribute to the families who said yes to donate the organs of their loved ones who died tragically, thus saving the lives of those who received a donated organ. At Jūratė’s last Valentine event, in February 2015, as part of The Toronto General Hospital Foundation’s “Heart in the City” fundraising event, Jūratė was interviewed on Toronto’s popular CITY TV’s Breakfast TV with 20 other transplant recipients. They acknowledged on air to the hundreds of thousands that tuned in, just what the Toronto General Transplant team meant to them. If the program was successful in saving just one life by encouraging people to sign their organ donor card, it was worth the effort. Little did we know that Jūratė would pass away in a few weeks. This coming Valentine’s my daughters and I will continue the cookie appreciation program in Jūratė’s memory to say thank you for the ten extra years we had with her and the legacy Jūratė left. 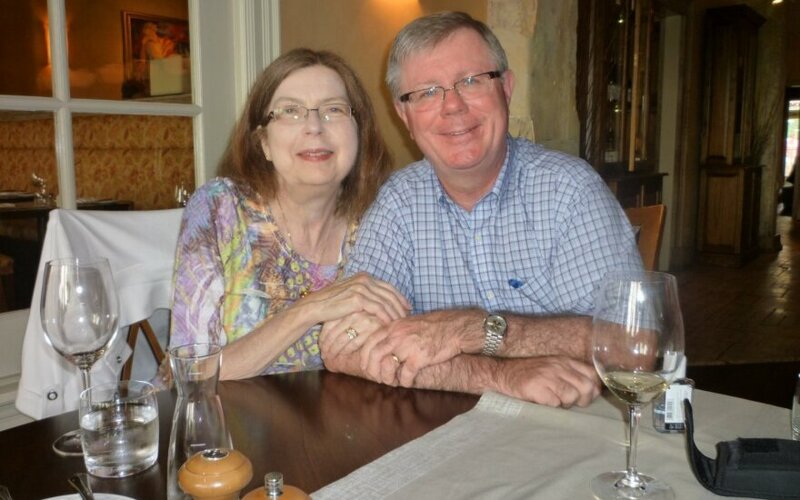 In September 2014, in conversation close friend and Coordinator of Post-Transplant Care, Stella Kozuszko (RPN), Jūratė got people thinking about a speaker event for caregivers to offer coping strategies to deal with the stress that comes with a life-saving and life-changing heart transplant. Peer reviewed literature shows, quantitatively and qualitatively, that taking care of the caregiver enhances positive outcomes and quality of life for the recipient. In March 2015, Stella attended the IHSLT Conference in Nice France. It’s an annual scientific conference attended by hundreds of leading heart and lung transplant surgeons, scientists, doctors, and nurses from around the world. After attending a number of poster sessions on the positive outcomes of coping strategies for caregivers of heart and lung transplant patients, Stella emailed us declaring that the seminar was indeed needed. Unfortunately, Jūratė passed away a few months before the event took place. Our daughters and I, in concert with Stella, and the psychosocial team at Toronto General continued to organize a seminar for caregivers. Called “Coping Strategies for Caregivers of Heart Transplant Patients”, the event was dedicated in Jūratė’s memory. Attendance was overwhelming. Given the large numbers that attended, the transplant team decided to dedicate resources to a new pre- and post-transplant counselling program to help caregivers and their families cope with the medical, family and financial challenges heart transplantation can present. It’s now almost a year since Jūratė passed away. The transplant experience, and the volunteer work we did, became a very large part of our identity, making the loss that much greater. We continue to mourn our loss as we begin new chapters in our lives. It’s difficult filling the huge void without Jūratė in our lives. We find comfort in the photos we took and archived. They bring back happy times. Jūratė leaves a legacy that will live on for a long, long time. Who could ask for more? Jūratė was an amazingly supportive mother who lived knowing that someday she would not be there for her daughters. Right or wrong, Jūratė protected them from some of the facts not wanting her burden to become theirs. She knew they were wise enough to know that she was living on borrowed time after a heart transplant. The average life expectancy is ten years…..with amyloidosis, even shorter. She helped them grow and mature to become the amazing women they are today. Stefanie graduated after Jūratė passed away and is now working at a bank and Jessica continues to teach at the university Jūratė and I attended, while finishing her Ph.D.
We miss her profoundly. But we understand that we could not have asked her to suffer any longer. We had to let her go. While we miss her, it’s comforting to know her suffering is over. As we age we must learn to accept our mortality as a positive force knowing that age brings a form of suffering that requires amazing emotional strength to cope. Considering Jūratė’s mountain and desert experiences she taught us many lessons. Jūratė taught us to be strong. No one knows what life will bring. We must learn to accept life with courage and humility. I have so much respect for those who are chronically ill and carry themselves with such confidence, poise and humility. It is difficult to comprehend the burden they shoulder every day. I can only hope to learn from the example Jūratė set. My complaining over life’s unfairness was a waste of precious time. There are many things we have little or no control over but we can control how we chose to live and treat others. Through this experience we grew, we met many amazing people, we learned to cope, and we learned to live life to the maximum. It came, at times, with frustration and pain. But as Dr. Ross would say, “Test Your Limits”. Learn to tame your fears and harness the energy within. That we did. You never know where it will lead. Be humble and the world will beat a path to you. Most of all, enjoy life because you just never know when your turn will come. One of Jūratė’s favourite songs was Coldplay’s “Vida la Vida”. Jūratė and her daughters would sing the song when it came on in the car. Translated, “Vida la Vida” means long live life. The last two lines of the song are “Never rule this world, But that was when I ruled the world”. It gives testimony that if you choose, you can take control of your life in spite of the unfairness that surrounds us. Jūratė did just that. She was in control, all the time. In dying Jūratė taught us much about living. Her strength and her faith enabled her to face death with courage and in spite of the challenges, live life to the fullest. Jūratė’s love, affection, her smile and her humility are deeply missed.